Last weekend I returned from a week-long, beach vacation in Mexico. I did nothing other than sit on the beach, read, people watch, jump in the Pacific and eat and drink my way through the town. This was basically my view for about 8 days. Before going I had asked friends for suggestions of good beach reads – nothing too dense, fiction, perhaps suspense or mystery. I received plenty of ideas, and in addition to having my Nook with me I picked up two paper backs. 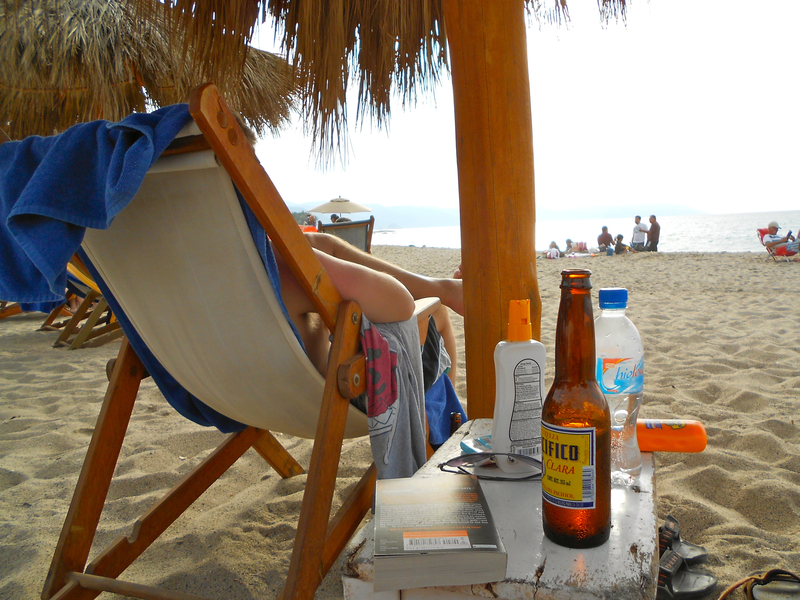 (I’d rather a paper back be destroyed, stolen or lost, so they were my intended beach-time indulgence.) I downloaded a free sample to my Nook of both books and read them on the plane to figure out which I would read first. We arrived on Saturday, and by Thursday I had completed the first book. It was fine, it was interesting, it was the right mind-candy. THEN I started the second book. Just as I had done with a bowl of Lucky Charms when I was a kid, I saved the sweet marshmallows for last. I was immediately intrigued by this one with the sample, and by the time we left on Sunday I was about two-thirds through it. Incredibly Loud and Extremely Close by Jonathan Safran Foer quickly moved into the ranks of some of my favorite books. It hadn’t been a suggestion, but the recent movie ads had intrigued me. It seems like it might be a bit sappy, but the story struck me as possibly being imaginative and epic. I came across the book on one of my final dash-to-Tarjay-and-get-stuff-for-vacation trips and I was still searching for a second book. They didn’t have what I was seeking, but I saw this, I picked it up and thought…well, why not? As with most people, when I read a book there’s a specific voice that I hear. It gets established quickly in my head and remains there unchanged. (I don’t know how it happens or how it all works. I’ve talked to people about it and my experience makes sense to some, but I’ve had a few people who think I’m a bit looney.) This kid’s voice in my head narrating the book was immediately charming and fun. His words and the writing flowed easily from one thing to the next, like some kind of ADD issue was involved, but I flowed with it, enjoying the ride and feeling very much in tune with him. It was going to be a perfect read. The only problem was every once in a while I’d have to put it down. There I was in a tropical, relaxing setting, and suddenly because out of nowhere would come this beautiful or touching image or passage or something that reminded me of someone or something….I’d find myself gasp at a line, and tears would roll down my cheeks. I’d have to put it down. Yes, it’s about 9/11, or at its basis that’s the event that propels the story, but it’s really about so much else. Family. Relationships. Wonder. Hope. Fear. And there’s no evil in this book. The, for lack of a better phrase, heart wrenching elements are out of compassion and kindness. And there are surprises and twists along the way. Also, it’s a visual book. There are graphics and photographs and fonts and text designs all along the way. There’s a whole monologue for two pages written in numbers because it’s spelled out on a telephone keypad. It didn’t matter that I didn’t know the specific words (although I want to translate it now) because I know what the character was saying – and it was beautiful and touching. There are places where words are missing or written over each other and illegible. It’s not just text. The art here is also in these visual elements. It makes for a brilliant package. What I really wonder is how the movie could possibly be made. There are, essentially, multiple story-lines happening, and in fact the POV of the writing changes between three different characters. (I suspect the movie doesn’t do this.) Any one of these points of view make for a good story, and as I was reading it, with the words flowing so naturally and interestingly as they do, I kept thinking how I wished this were an unknown writer and not a book with a major film version, because I would love to create a stage piece from these characters and words. In my head I could see something imaginative and playful and just a bit stylized, as if Dominique Serrand or his now defunct Theatre de la Jeune Lune had created it. It’s that kind of lovely. That kind of creativity. I don’t know. Maybe I was in the right place at the right time to read this. Even if that’s just the case, I relished my time with it and I’ll miss these characters. Of course, I’ve already downloaded Foer’s other book.